Europe’s values are being destroyed by a “culture of hatred”, yes. But lets not call Islam a culture, it isn’t. Its a cult of hatred. The President of the Czech Republic has warned that Europe’s values are being “jeopardised by a culture of hatred that is incompatible with ours”, and said that “Israel and its heroism are a model and encouragement for us”. 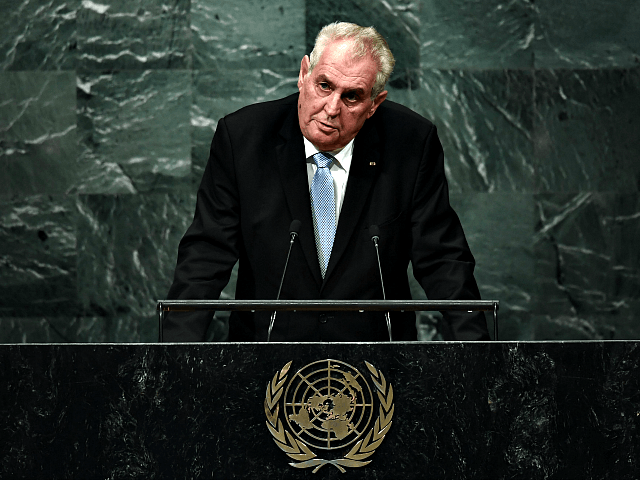 Miloš Zeman is a former leader of Czech Social Democratic Party and considered something of a left-wing populist, but has maintained a robust stance against mass immigration and multiculturalism throughout his time in office. “The European Union has already experienced many crises,” explained the 73-year-old, in an interview with Israel Hayom transcribed by the ParlamentníListy.cz news portal. “We are now dealing with a large-scale immigration crisis related to terrorism, which puts the EU in a situation where the EU has to take very specific and very effective steps. Its not an “immigration crisis”. Its a well organised Islamic invasion to destroy Europe as we know it. “It is a serious situation in which the fundamental Judeo-Christian values of European culture are jeopardized by a culture of hatred that is incompatible with ours. As I have already noted, Israel and its heroism are a model and encouragement for us,” he said. President Zeman, a strong supporter of Israel and one of the few European heads of state to back U.S. President Donald Trump’s decision to officially recognise Jerusalem as the capital of Israel — and blast “the cowardly European Union” for its decision to support “a pro-Palestinian terrorist movement” instead — said he would be urging incoming prime minister Andrej Babiš to follow the U.S. premier’s lead by moving the Czech embassy from Tel Aviv to Jerusalem. Zeman has also been a strong supporter of the Czech parliament’s moves to introduce a kind of Second Amendment for its citizens — in the teeth of fierce opposition from the EU establishment — noting that “the level of international crime is growing because of Islamic terrorism” in a speech to the intergovernmental Council of Europe. “What can we do against international criminality? Invest in the police, invest in the army, and have the courage to invest in our own guns. “My wife has a pistol. Of course, she passed all necessary tests, but now I am guarded by my wife, and not only by bodyguards,” he told his scandalised European audience, who tend to take a dim view of the right of ordinary citizens to keep arms for self-defence — with the notable exception of Switzerland. President Zeman has been a fierce critic of the European Union’s institutional stance on mass migration, describing the migrant crisis as “an organised invasion and not a spontaneous movement of refugees”. The Czech Republic will likely become the most Eurosceptic country in the EU after the United Kingdom has left, leaving Brussels mandarins seriously concerned a ‘Czechout’could be their next major headache after Brexit has been completed. Officially, President Zeman and Prime Minister Babiš both say they would prefer to reform the bloc from within, with Zeman telling Israel Hayom that “the four Visegrad states that have had unhappy experiences with totalitarian regimes in the past” — Czech Republic, Hungary, Poland, and Slovakia — “can and should be the real engine of change within the EU”. This anti-mass migration, pro-sovereignty alliance has recently been bolstered by the ascension of conservative-populist coalition government in Austria, which will have a strong focus on tackling illegal immigration and radical Islam. So, apparently the Czechs are the only intelligent people in Europe. Good for them.